The project involves replacing and upgrading approximately 0.6 miles of 8- and 10-inch-diameter water main in Hidden Mesa Road with 12-inch-diameter piping, abandoning 0.55 miles of 12-inch-diameter water line along Vista Vereda, Hidden Mesa Trail, and private property easements, and installing 0.35 miles of 2-, 4-, 8- and 12-inch-diameter water line along Vista Vereda. The project will also remove a 12-inch-diameter water main that can no longer reliably provide service to the area. The project is located in the Hillsdale area of Rancho San Diego. The Hidden Mesa Road water line replacement construction will extend from Vista Grande Road on the east end to Hidden Mesa Trail. The Vista Vereda water line replacement begins at Vista Grande Road on the south end along the entire length of Vista Vereda. Construction will start in December 2018 and is scheduled to be completed in July 2019. The District has contracted Cass Arrieta to construct the project. The District provides water service to the Rancho San Diego area and regularly invests in capital improvement projects to assure efficient operations, comply with regulations, and replace aging infrastructure. District projects are funded through user rates and capacity charges. The project will transfer the transmission capabilities for the western portion of the 978 pressure zone from a water line located within private property easements that are difficult to access, to public right of ways where maintenance and monitoring are readily accessible. To ensure a seamless transition, the water line in Hidden Mesa Road will be constructed first from east to west with temporary water connections to maintain continuous water service to customers. 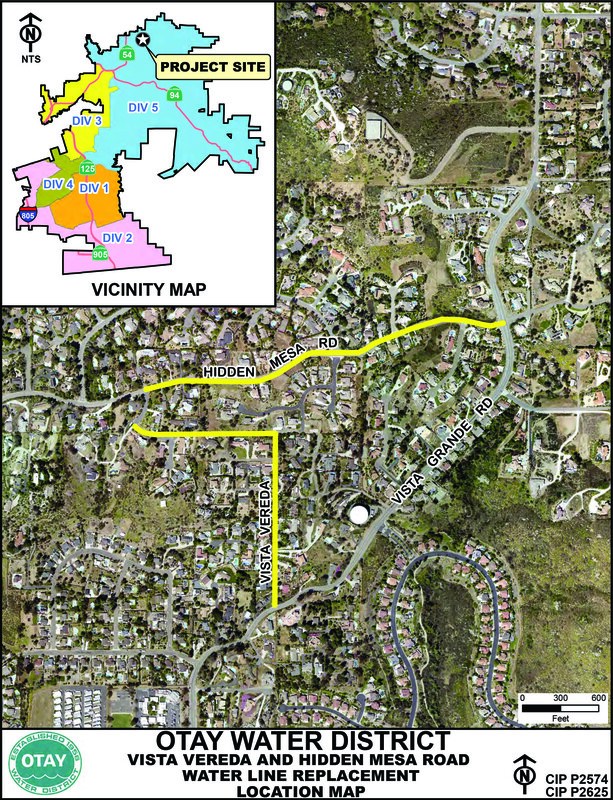 Once the water main in Hidden Mesa Road is completed and has taken over transmission duties, the replacement of the water line in Vista Vereda will begin with reduced size piping for much of the alignment to handle the lower distribution duty of supplying water to residences in the area. It is anticipated that there will be several temporary interruptions of service of no longer than a day during the transfer from the old water mains to the new ones. The District’s budget for the Vista Vereda and Hidden Mesa Road Water Lines Replacement Project is approximately $3.85 million. For additional information about the project, please contact the Project Manager Steve Beppler at (619) 670-2209 or via e-mail at steve.beppler@otaywater.gov.